The most far-reaching announcement made during Apple CEO Steve Jobs' Feb. 22 keynote speech at Macworld Tokyo was that the GeForce3 graphics card is coming to the Mac first. Interestingly enough, Apple has downplayed the announcement, at least in regards to its own press releases. Be that as it may, the GeForce3 is the world's most advanced GPU (graphical processing unit) with more than 57 million transistors and the ability to perform more than 800 billion operations per second and 76 billion floating point operations per second (FLOPS). The GeForce3 GPU achieves 3.2 billion anti-aliased samples per second fill rate -- more than four times the performance of the award-winning GeForce2 Ultra and more than seven times the processing power of any competitive consumer graphics product, according to Nvidia. And it drives resolutions and color depths of up to 2048x1536x32. "The first film Pixar ever made, 15 years ago was called 'Luxo, Jr.,' Jobs said during his keynote. "We made it using a Cray supercomputer and it took three hours for each frame to compute the graphics. Since there are 24 frames per second, that meant it took more than 75 hours per second to compute the graphics. Well, with the GeForce3 on a Power Mac, we can do that same operation in real-time today." The GeForce3 is powered by the new Nvidia nfiniteFX engine, which means that 3D scenes have ambiance because objects appear photo realistic and custom lighting heightens drama and emotion. Characters and living creatures have organic behavior and unique expressions -- their personality emerges, according to an Nvidia press release (yep, they did a press release, hours after the keynote). Programmability and performance are the catalysts for this graphics revolution. "This announcement comes just one month after the first Nvidia-based Macintosh launch," Jen-Hsun Huang, president and CEO of Nvidia, said in the press release. "We are excited to have the first public showing of GeForce3 at MacWorld Tokyo in Steve Jobs' keynote address. The combination of our new leading-edge technology with Apple's is going to send shock waves throughout the Macintosh community." Huang said that the GeForce3 is the first fully programmable GPU. The nfiniteFX Pixel Shader processor and Vertex Shader processor give developers the ability to program a virtually infinite number of special effects and custom looks. The GeForce3 is also the first high-resolution anti-aliasing (HRAA) GPU, featuring Nvidia's patented Quincunx AA mode, for high-resolution, high-quality, high-performance multisampling capabilities. Nvidia also says that the GPU is a platform for advanced transform and lighting features, enabling more complex, visually exciting objects and scenes. The GeForce3 is also OpenGL 1.2 compatible. It's available in a 64MB DDR SDRAM configuration that supports both the Apple Display Connector and the industry standard VGA connection. The GeForce3 GPU's nfiniteFX engine gives developers the ability to program a virtually infinite number of special effects and custom looks, according to Nvidia. Instead of every developer choosing from the same hard-coded palette of capabilities and ending up with a generic look and feel, application developers can specify personalized combinations of graphics operations and create an unlimited list of their own effects, the company said. Two architectural advancements enable the nfiniteFX engine's programmability and its multitude of effects: Vertex Shaders and Pixel Shaders. Vertex Shaders inject personality into characters and environments. Motion invades the entire scene, not just the focal points. The vertex processing capabilities allow characters to move and show facial emotion, materials to stretch, and the scene to come alive, according to Nvidia press material. By customizing the skinning and motion, developers can create an appropriate personality, intensifying the impact of the visualization or animation. Pixel Shaders create ambiance with materials and surfaces that mimic reality. "Amazingly realistic" material effects replace the artificial, computerized look with high-impact organic surfaces, claims Nvidia. Characters now have facial hair and blemishes, golf balls have dimples, a red chair gains a subtle leather look, and wood exhibits texture and grain. By altering the lighting and surface effects, artists are able to manipulate colors, textures, or shapes and generate complex, realistic scenes. According to Nvidia, the Lightspeed Memory Architecture brings power to the GeForce3, delivering "earth-shattering performance and fluid motion even for the most complex scenes." The company said its new Quincunx anti-aliasing (AA) mode generates high performance samples at nearly four-times the rate of the GeForce2 Ultra, with excellent visual quality. Rendering at high resolutions with high frame rates becomes the standard with GeForce3, as its advances in pixel rendering and memory efficiency break down the boundaries of frame buffer bandwidth and enable high-resolution anti-aliasing (HRAA) for the first time ever on a personal computer, according to the company. The GPU also boasts a high-definition video processor (HDVP) that enables a variety of crystal-clear HDTV solutions when combined with a mainstream CPU and a low-cost DTV receiver. The HDVP allows mainstream high-performance processors to support all 18 Advanced Television Standards Committee (ATSC) formats with a DTV receiver card. GeForce3 graphics on the Power Mac G4 will be available next month as a build-to-order option at the Apple Store and through Apple resellers. 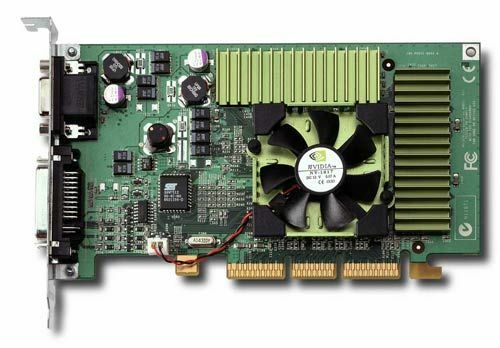 Equipped with 64MB of DDR-SDRAM, it will cost US $350 more than a standard Radeon/GeForce2 MX configuration as a BTO option -- or $600 for a stand-alone card. During the presentation of the GeForce3, id Software's John Carmack demonstrated the gaming engine that powers id's forthcoming first-person shooter Doom 3, running on a G4 with the new GeForce3. This story, "GeForce3 puts Mac at the head of GPU field" was originally published by PCWorld.